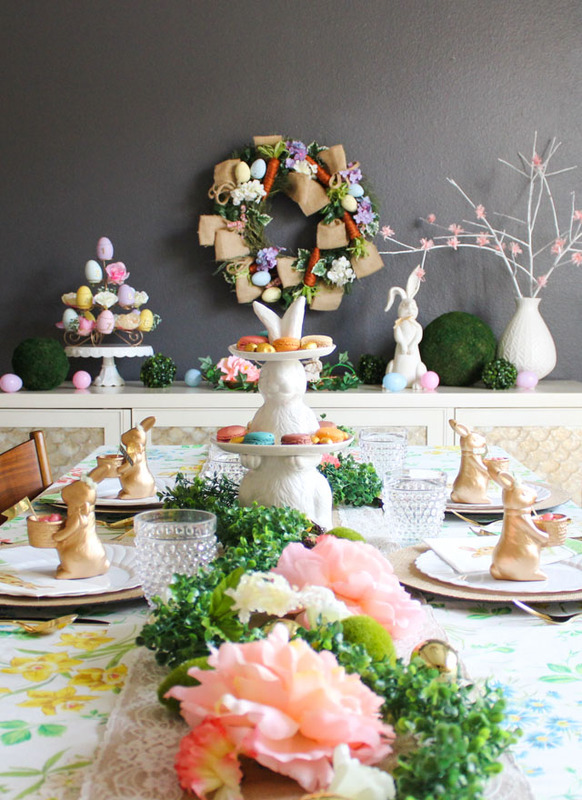 Floral and Bunny-Filled Easter Table Ideas! I’m so excited about how this Easter table turned out and I can’t wait to set it all up again for Easter morning! 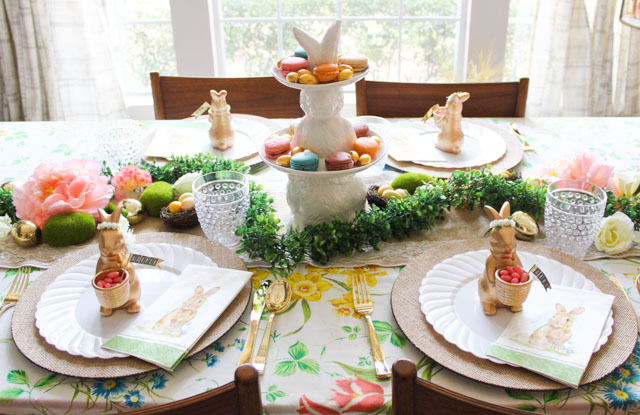 My latest project with Oriental Trading incorporates some of their gorgeous floral and greenery supplies along with a few sweet bunny accents to create this floral and bunny-filled Easter tablescape. Whether you want to go all-out like this, or just incorporate a few floral accents, I hope these ideas inspire you to make your Easter table a little extra special this year. 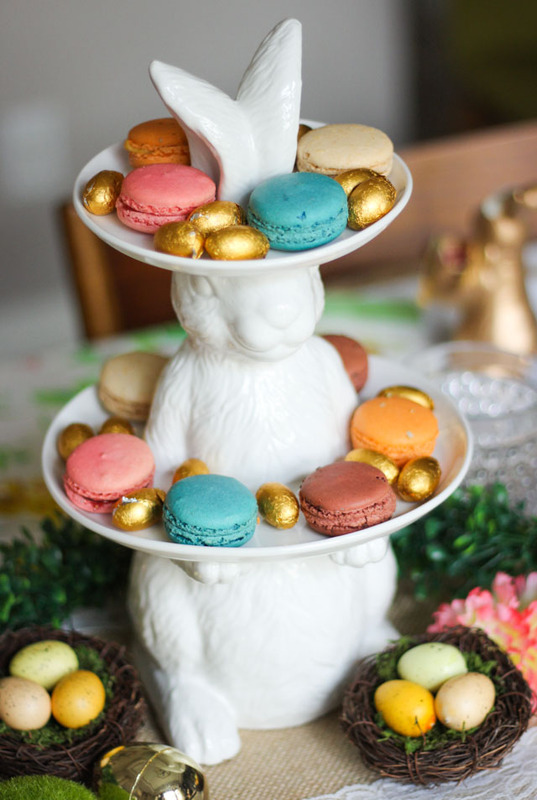 This tiered rabbit tray is the star of the table, serving both as a simple centerpiece and a holder of sweet treats. My favorite types of centerpieces are the ones that can do double-duty! 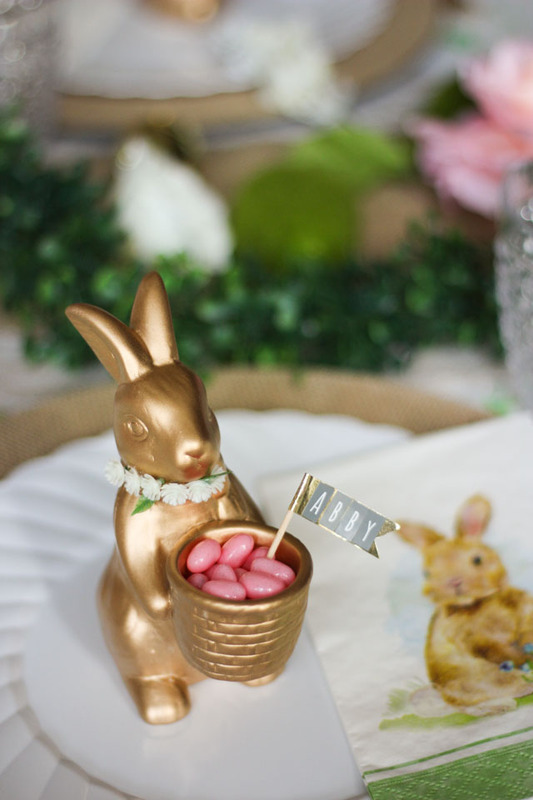 My daughters loved these cute bunny place cards – primarily because they contain candy! Stick a little name flag in there and these bunnies do double-duty too. They are also the perfect size to hold an egg, which would be sweet with each guests’ name written on it. To make these place cards, I spray painted a pack of six ceramic bunnies and added a little floral crown. Check out the bunny place card tutorial for all the details. Down the center of the table I ran a faux boxwood garland and incorporated a variety of faux flowers, eggs, and these cool moss rocks. You can use a mix of whatever you have on hand, including some real flowers or greenery from your yard if you live in a warmer climate and aren’t covered with snow! Just stick with a soft pastel color palette with some touches of gold and natural elements and you are guaranteed a beautiful Easter table. Head to Oriental Trading’s Fun365.com site for the all the details of the Easter table including a full list of supplies and step-by-step tutorial for the Easter bunny place cards! This post is sponsored by Oriental Trading.